This is a funny animated gif of James May riding along on some sort of bicycle while the text "Swiggity swooty I'm comin' for that booty" is layered over it. May is an English television presenter that is best known for his role on the motoring TV show Top Gear. This is an animated gif of Jose Mourinho clapping his hands together while the words "Mind Games" appear. The Portuguese manager, who is currently the manager of English side Chelsea, is well known for employing mind games against his opponents in order to gain an advantage (it gets mentioned so much by the media that it has become a bit of a joke amongst soccer fans). If you're looking for more Mourinho gifs, you can check out this one of him waving his finger. This is the hilarious moment when Liverpool captain Steven Gerrard slipped in the game against Chelsea at Anfield, allowing Demba Ba to score. A week or two prior, the Liverpool skipper had warned his team mates "not to slip up." This is an animated gif of model Caprice eating an ice cream. Notice the slight eyebrow raise. Extremely Long Truck says "Good Job"
This is a funny animated gif of an extremely long truck driving out from underneath a bridge. The text on the side of the trailer reads: "Well done. You guessed correctly. You should feel really proud of yourself right now. You can go back to work and feel really good about your day. Because you know what? You achieved something! Boy, this is a long truck! What's in this thing? Oh here comes the end. Never mind. It's still going. Jeez. Okay. Here's the end. Congratulations again! You did a good job picking the right answer. Bye!" 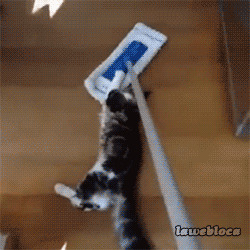 This is a funny animated gif of two cats grabbing onto a duster brush as its being pushed along the floor. This is a cool gif of Vincent van Gogh's The Starry Night painting being recreated / animated with dominos. This is a funny animated gif of two lizards putting their hands up and waving, as if to say "greetings, human!" Fun fact: These are female Bearded Dragons / Pogona. They put their hands like that as a sign of submission.